Coup in Turkey - People Power? It's sometimes hard to recognise the country you live in when you see it reflected back at you through the mirror of the media. Less than 48 hours ago I saw a mass demonstration of 'people power' save the country from a military coup. If I couldn't remember the explosions, and the sonic booms shaking the apartment block that I live in. I would have sworn that it happened in a distant land far far away. Certainly there was an attempt to stage a military coup here in Turkey on Friday night, and certainly it was defeated. That much at least is indisputable. However, the whole narrative about 'people power' defeating the coup makers seems to me to be an exercise in myth creation. True some people did come out on to the streets though if you had followed the events on the domestic and global media, you could be forgiven for believing that hundreds of thousands of citizens had poured out onto the streets, and prevented the military from taking control. The reality was actually a little different. I ventured out on Saturday lunchtime. Kizilay, the centre of Ankara was pretty deserted at the time. It soon filled up though with people celebrating their victory. Alongside the nearly mandatory national flags there were many waving grey Wolf flags and flashing the 'Wolf Salute', as well as flags representing Islamic radicals. They continued their celebrations into the night by attacking minority areas in true traditional Turkish nationalistic pogrom style, in Ankara, Istanbul, and other cities. The government is also out for revenge against its enemies. As well as arresting soldiers, it launched a new purge against those it considers to be its opponents in the legal system. In addition to rounding up thousands of soldiers, 2,745 judges were dismissed from their posts, and arrest warrants were issued for 140 supreme court judges. The list of these 'enemies of the state' was obviously not compiled overnight. I spoke to a Judge on Saturday morning who told me that the list had been compiled as long as two years ago. Most people are now expecting another round of purges. Turkey has become use to these sort of investigations in recent years. The 'Ergenekon' campaign enacted by the Erdoğan government in 2011, led to over 500 arrests. 6000 have already been arrested and we can expect to see more this time around. So basically different factions within the state fought a brief battle. The official death toll is 265 people, and the government is still in control, and planning further repression. Despite all of the talk of people bravely taking on the army, there certainly was no mass movement doing so, just small groups of rightist thugs. The next time I see talk of people power in some far off country, I'll certainly look more closely. 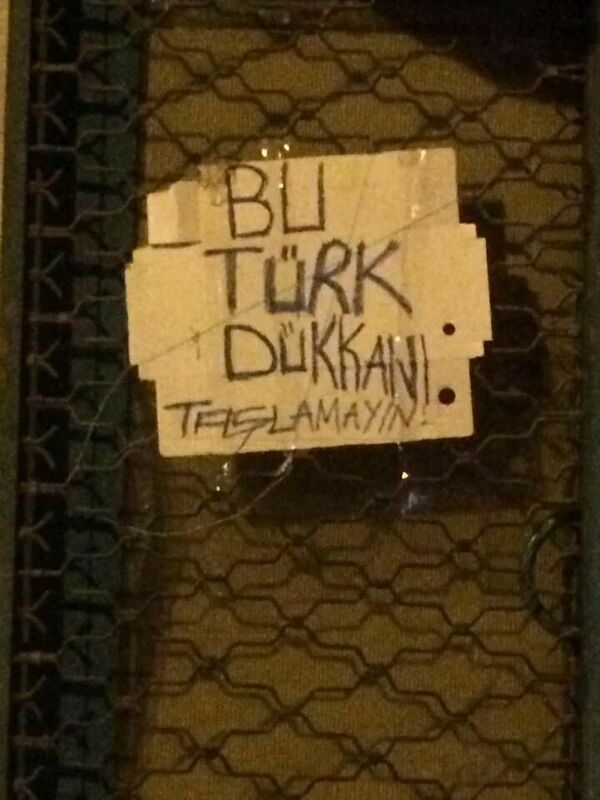 In the picture above the placard reads "This is a Turk's shop-Don't throw stones" Ankara yesterday. you talk about coup,s mistake of inability to bring people out into streets in their support! the coup does not need power of people, to changed fraction of state. it dose not believe on people at all. I think that in general these days coups do look to public support. The Turkish armed forces does look towards public support. Witness the 'Republic Protests' in 2007 when the Kemalists brought millions of people out onto the streets.